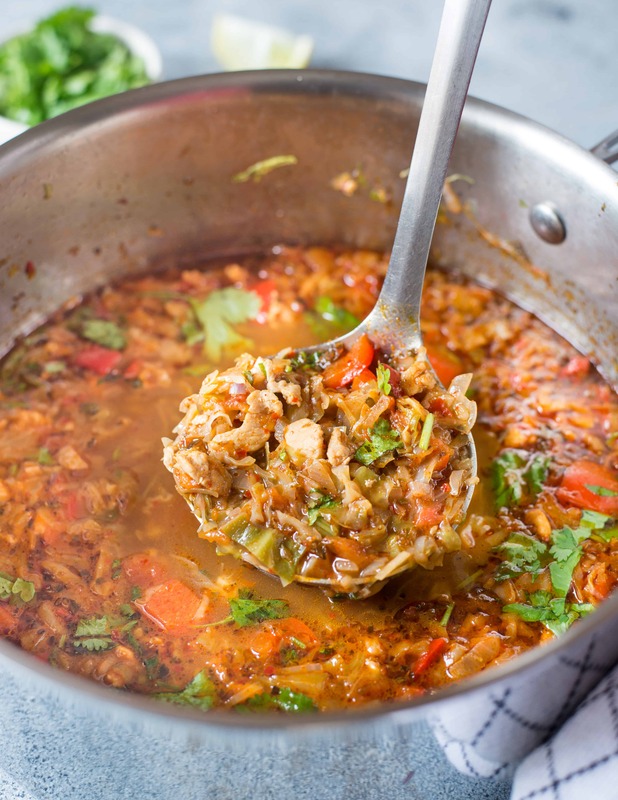 Low Carb Chicken Taco Soup is hearty, healthy and perfect for weight watchers. 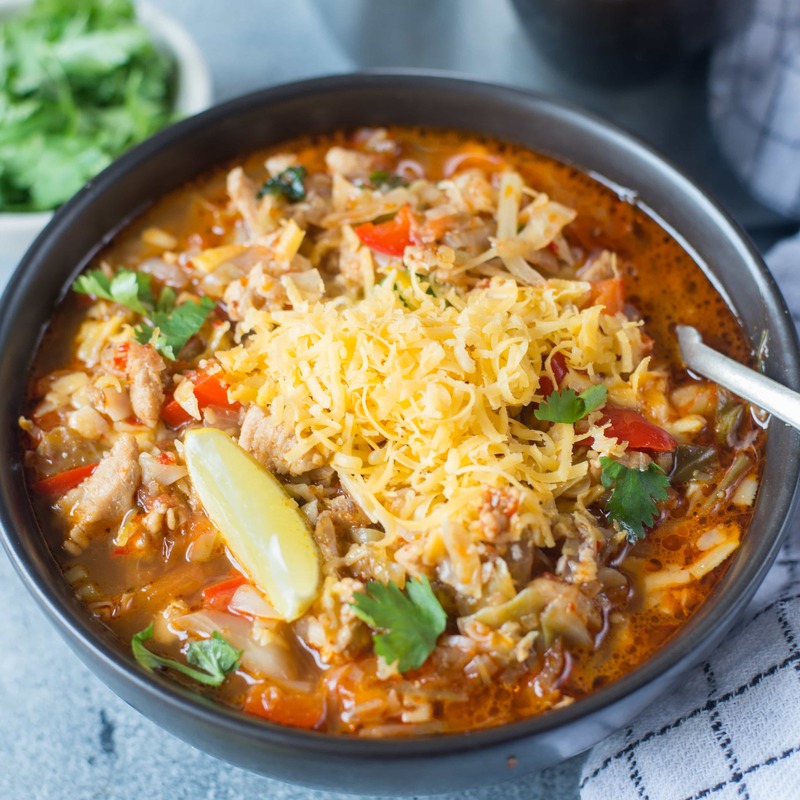 Packed with taco flavours, this easy Chicken Taco soup can be made on the stovetop in under 30 minutes. It is winter and soup appears on our dinner menu quite frequently. 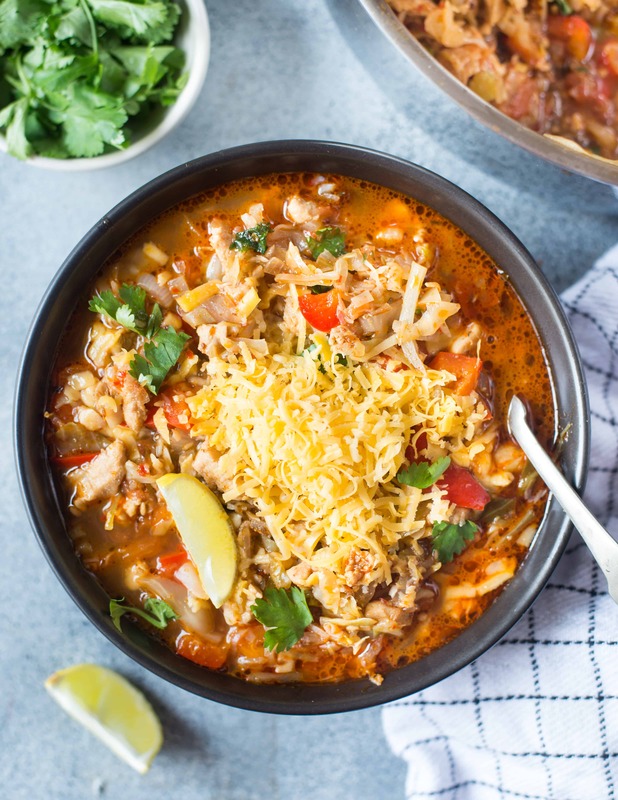 This Easy Chicken Taco soup was our dinner a few days back. It was delicious and filling. 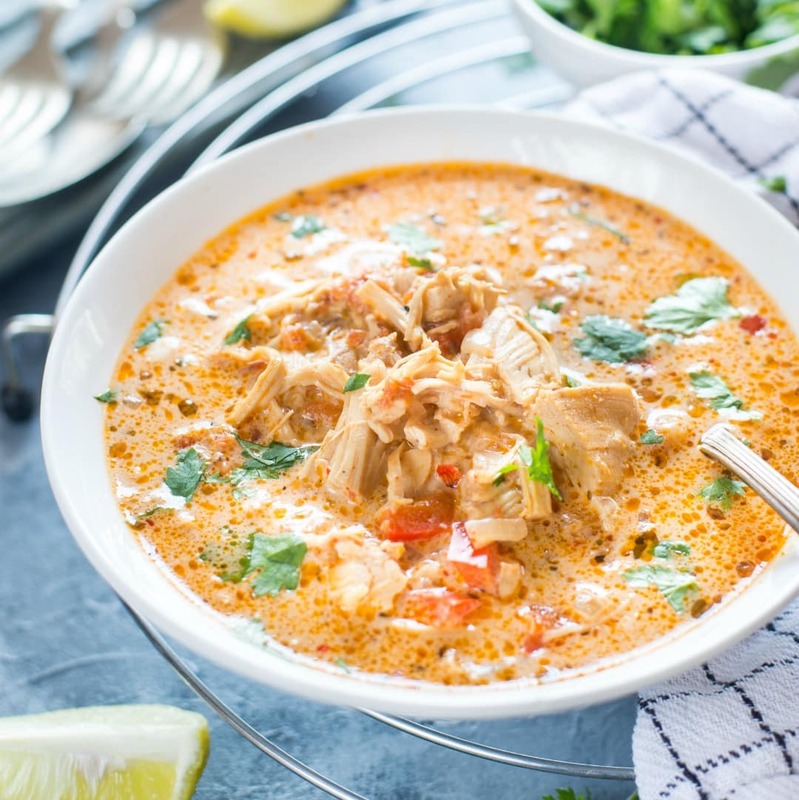 This Chicken Taco soup is low carb and keto friendly. But you can easily customize it and add your favourite ingredients like corn, beans etc. I have been following a low carb diet. And this Taco Soup with my favourite Mexican Flavours fits all the bill. In fact, the whole family loved it. It is also quick to put together on busy weeknights. Making Chicken Taco soup is incredibly easy and quick to make. The flavours are really fresh. It has got chicken, onion, bell pepper, cabbage. The low carb version is doesn’t have Corn and beans but you can certainly add beans to it. Cabbage is an excellent vegetable when you are on a low carb diet. It is not only very low on carb, but it also has other nutritional elements. So adding cabbage to the soup makes the soup really filling. If you are on low carb or Keto diet, you can absolutely adjust the quantity of the ingredients as per your macros. HOW TO MAKE CHICKEN TACO SOUP? Making Chicken Taco soup from scratch takes less than 20 minutes. You need one pot and can make the soup right on the stove top. Here is how the soup is made. Start with sauteing Onion and garlic in oil. Sauteing release all those flavours to the oil, so it is an essential step. Then quickly saute the chicken until it is translucent. Then add bell peppers and cabbage. Saute it until it softens. Then add tomatoes followed by seasoning and stock. Let everything simmer and it is ready. Now coming to the best part, the toppings. Cilantro, Jalapenos, sour cream and offcourse lots of cheddar cheese. And if you are not on a low carb diet, then add lots of crushed tortilla chips. 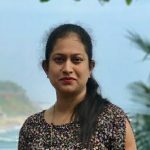 So, I have told the reason for sharing a low carb recipe. But Hey!! even if you are not following low carb diet, you can give this recipe a try. Its delicious with flavourful Mexican spices. You can add corn, kidney beans and top it with crushed nachos/Tortilla chips to make it more wholesome. 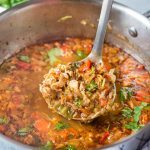 This Low Carb Cabbage Chicken Taco Soup is light, healthy and perfect if you are on a weight loss journey. Just add Corn, Kidney beans and top it with nachos to upgrade it. Heat oil in a pot. Add minced garlic. Saute till it starts to brown. Add chopped onion. Fry till it is soft and translucent. Add chopped celery, followed by chicken chunks. Fry for one minute. Add shredded cabbage. Cook for 2 minutes. The cabbage will start to soften. Add chopped red bell pepper. Cook for 30 seconds. Add Tomatoes. Mix everything well. Add all the spices. Mix everything well. Cook for 2 minutes more. Switch off the flame. Garnish with fresh coriander leaves, lemon wedges and top it with cheese while serving. Chipotle chilli powder gives a smokiness to the soup. You can substitute with smoked paprika or chilli powder. You can skip the spices and add 1 heaping tablespoon of Taco seasoning. Adjust the heat as per your preference. You can also substitute the spices with readymade Taco seasoning. In that case, adjust the amount of garlic as taco Seasoning already has garlic. Add warm stock to the soup. This soup is f–king amazing. 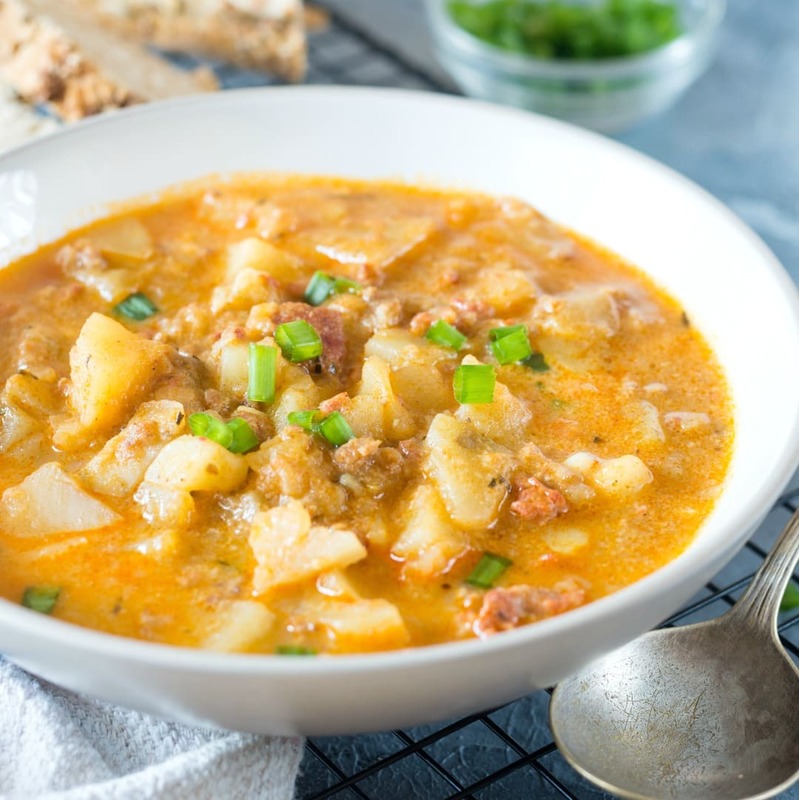 Hubby and I are on keto for a hormone reset and this soup was full of flavor, rich, and satisfying both for my taste buds and my body. I do CrossFit and one boyo of this was enough to fuel me up. I used a lot of home made chicken broth for the base also so that added plenty of fat, nutrition and flavour. So glad that you all liked it. This is one of our favourites too. Does it say anywhere what the carb count is per serving? I can’t seem to find it.